This is a friendly reminder that Christmas is only 10 weeks away. Yes, TEN WEEKS!!! Almost into the single digit weeks until Christmas means it is NOT too early to be thinking about American made Christmas decorations! We are excited to be working with Crab Pot Trees again this year to bring back this popular giveaway. Crab Pot Trees are Christmas trees made from….crab pots! A string of lights woven through American made crab pot mesh creates the beauty and the simplicity of the Crab Pot Tree. Handcrafted on the shores of North Carolina, Crab Pot Trees were originally created as a frugal way to use up leftover crab pot mesh, and as a unique way to keep the makers of crab pots employed during the winter off season. These easy to display lighted trees quickly caught on with the locals, who fell in love with the nautical themed holiday decorations. 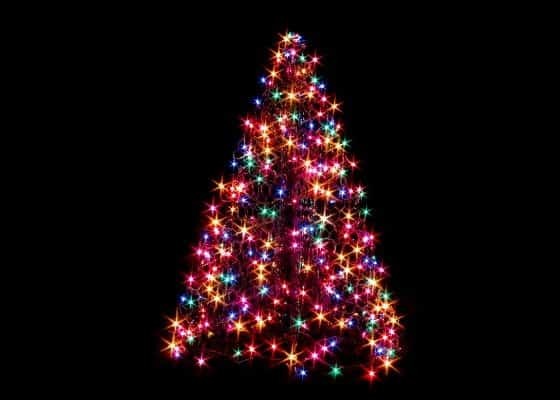 Crab Pot Trees with incandescent lighting have been a favorite of ours here at USA Love List for years now, and we are excited to share with our readers that Crab Pot Trees are available with LED lighting! * Please note: The LED lights are NOT made in the USA. Currently there are no LED lighting strands made in America. LED lights use 1/10th of the electricity as standard incandescent lights. 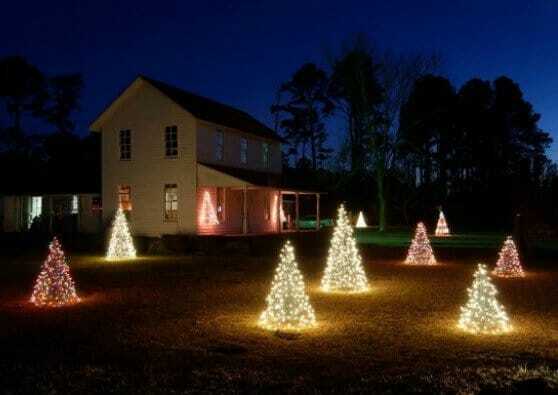 This means you can decorate your yard with MORE LED lit Crab Pot Trees and still save $ on your electrical bill. LED lights last many years longer than incandescent lights, so Crab Pot Trees with LED lighting will last even longer. The LED light strands also have waterproof bulbs, so they are just as durable as the incandescent bulbs. Keep Crab Pot Trees in mind when you are looking for unique American made holiday decorations all year long! 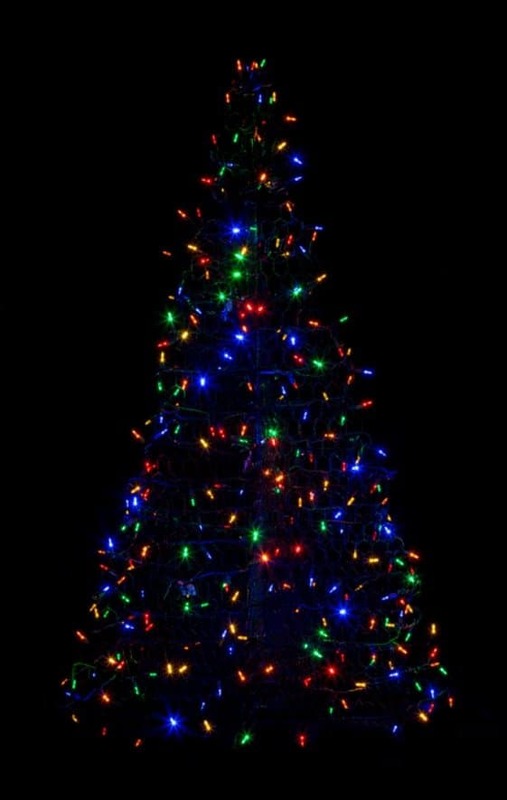 Enter now to win a fabulous 5 foot tall Crab Pot Tree with multi colored LED lights. A prize valued at $250! Click the +1 button for further instructions on each entry. This giveaway will close at midnight on Thursday, October 26. The winner will be randomly selected, verified for correct entry participation, and notified by email. What is a +1 button? This company seems awesome for using LED lighting. It took me a while to get used to the color difference, but knowing they use 1/10th energy – I am sold! I’d like to win this because it would really be a great addition to our Christmas decorations. Very neat idea! I would love to win because these are really nice and would look great on my front lawn. They really have all sizes, don’t they? The small 1 1/2 foot trees would be great tabletop decorations. The Patriotic Tree is pretty neat, too. I do try to buy from companies in the U.S. whenever possible. I like knowing I’m getting a certain standard of quality. I do not own a Crab Pot tree but I sure would love to have one. My favorite is the 5′ LED Crab Pot Tree. I love that it is waterproof and it would look great in front of my house. I always try to buy American to help the economy and to keep the American people working. This is awesome and I’d love to have one right on my front porch. We have to support the USA and the quality will be much better as well. We need to keep our economy growing and all things need to be made here to keep people working. I would love this because we currently don’t have anything outdoor decorations for the holidays. We have a 4′ tree we always put near our front entrance that Carolers stand around at the holidays! Where is the +1 button in order to enter the contest? Thanks. I’d like to win this for my daughter. She loves to decorate our home for the holidays. I want to win for my front porch to be lit with this beauty. I’d like to win this because these are a little different & I like that, lol. They’re really neat looking. I think the little ones are pretty cute, too. I could see using them to line a walkway or deck. Trying to buy American-made is pretty important to me. I like being able to support new businesses or local places or even local farmers selling at Farmers’ Markets. There are so many ways you can buy American-made goods at least part of the time. I really want to replace my ex’s and my old decorations. They were cheap and looked it. I’d rather get nicer looking stuff (like this) and stuff made in America is all the better! I would love to win because they are so different and unique. I love the Crab Pot tree. It’s not too big and not too small and would be perfect in my den. I always try to buy American to help the economy. I’ve always wanted some type of outdoor Christmas decor for my house. These trees look so pretty! I think these trees look so pretty. I would love to have one for my back yard so that I can look out and enjoy it more. I try to buy American to keep work in America! I want to win because I like the looks of these and would like more than one for my yard. I have never had one and would put one on my porch and would like a few more for my yard also. We need to get America back to where it was, more jobs, and people working which is what we all need. I’d like to win this because I think it would really brighten up our Christmas decorations! These are a really neat idea. I like the ones with the multi-color lights best, I think. The more flashing lights, the better, at Christmas, lol. Buying from American companies is fairly important to me, I’d say. I definitely look for made in America tags. Supporting new or local businesses is something I try to do, too. 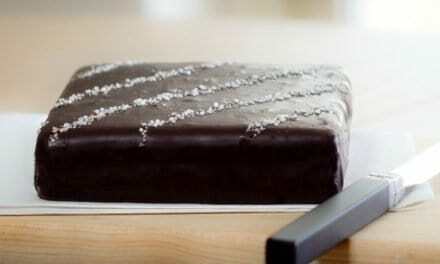 I’m from the area where these are made but due to the military, now live far away from there. I would love to be able to decorate with something from back home. I didn’t know that this style of tree was called a Crabpot tree! I love the shape and would put it at the edge of the forest in our backyard. It would be so pretty shimmering in the snow! I would love to win so I can enjoy seeing it all winter in the snow, pretty! I like to buy American made to support American workers and because products are almost always a better quality. I want to win to have my home beautifully decorated. We need to get our people back to work so it is important to support the USA. I would love to win because these look beautiful! I’d like to win this because it would definitely add something new to our Christmas decorations. These ‘trees’ really are nice. I love the idea of using them outside but I could see using this as your Christmas Tree if, like me, you’re disabled & have trouble decorating a regular tree! I do try to buy American-made goods whenever possible. I just like knowing certain required standards have been met & what I bought wasn’t made by workers being treated like slave labor. You don’t necessarily get that when it says made somewhere else. I would love to win because they are very different. I want to win because these are cool looking. American made means better made and puts people to work. I love American made products because it means helping my country. These trees look so sturdy, beautiful and easy to store. I try to buy American made products to support American workers, and because I believe the quality is better than most imports. I’d like to win this because it looks like a really unique Christmas addition. My favorite might be the multi-light style. I’m a sucker for flashing lights at Christmas time, lol. I do try to buy American-made. I especially like buying from new, small businesses. Hey, helping them out feels good. I like American made goods because I want to reduce my carbon footprint. Love that these are up cycled too! I have been wanting 1 of these trees! I love that they are American Made of course and they are very unique!! I could definitely use one or more of these for my porch. I love that they are easy to store too. I really love the multicolored trees the most and think the 5 foot one would be perfect for my front porch. If I win I will put the crab pot tree in my front yard along with my locally handmade Santa sleigh and reindeer. The crab pot tree will be a perfect addition. I want to win because these look terrific and I would love to have one or more in my yard to look great. I do not own one but would love the Patriotic tree on my front porch. I would love to win a crabpot tree, because they are apart of our local heritage. I’d like to win this because our Christmas decorations are looking a little tired. We need something that looks great, like this. I love the look of these. These would look great outside or inside. I especially like the multi-color lights. I do prefer to buy American-made. I like knowing that there are certain standards being met. I love the unique and know my family would think these are very cool! I love that these trees fold fly for storage. Always have to think Storage! I want to be the first one in my area to display one of these beauties!! I have never seen them around here! I like that my electric bill won’t be high displaying these beautiful trees! I always try and support our American workers and buy products made in the USA as much as possible! I really like these which is why I want to win. No I do not own one ad would place on my front porch if I was lucky enough to win. Too many people are still without work so we need to make more in the USA and besides that, they are much higher quality products if we make at home. I’d like to win this because it’s a pretty unique Christmas decoration. I like that it’s a little different. I like all the possible light colors. I bet the gold lights would be really beautiful, or the multi-colors. Buying American-made products is important to me. I like buying from new companies or local businesses, and hopefully helping keep them in business. I do not own a Crab Pot tree yet but would love to! I always get better quality when I buy American Made products! I just really like the look of these and would like several for our yard and porch. I do not own one and my first would go on the porch. Others I want would go in the front yard. Better made in the USA and will help grow our economy and put people to work. I’d like to win this because it’s just a great addition to any Christmas decorating. It would look great. Buying American-made matters to me. I like knowing I might be helping out a U.S. based company. I’d love to put this up in our front yard. Not a lot of Christmas trees in Tucson! When you don’t have any trees to decorate in your yard,this makes it perfect for Christmas. I don’t own one now but with a lot of luck, maybe I will soon. I like their patriotic tree a lot. Keep people in the USA working and get a much better product from home. I’d like to win this because it would be a really nice addition to any Christmas decorating. It really looks great & it’s a little different, which I like. I would probably use this as our literal Christmas tree. I think it would look great as the tree. I’m a big fan of lots of lights, lol. I like buying from companies that are American-made because I can rely on that extra assurance that certain quality standards must be met. The bonus is you are helping those businesses out, of course, & maybe helping to create jobs. I want to win because it’s pretty and would look great in our new yard. I do not own a Crab Pot Tree. If I win I would put it in our front yard. I love the various sizes you can get and think these are terrific. I do not have one but maybe that will change soon. I would put it on my front porch. We need to get the lights made in the USA also. Put people to work and there are many who need a job. I’d like to win this because it would look great as an addition to our Christmas decorations! I love lights, lol. I hadn’t seen these before I saw them here, but I love this idea. I could see using this as the actual Christmas tree inside or as outdoor decoration. I do like to buy American-made whenever I can. I like that extra reassurance of knowing certain quality standards have been met. I love the look of these trees and would love the 5 ft. size. I really want to win because I love unique decorations and this is definitely unique! I try to buy American Made when I can because it is important to support our American workers! I do not own one and would love a few actually for my front porch and yard. It is important we put people in our own country to work and stop supporting other countries. First, I love that it’s made in the United States. Plus, it would look so nice in the yard and then after storing it, it’s all ready for next year. I had never heard of the crab tree pot until this post. I’d love to have the multicolored one. My dad worked in the Steel mills and always taught us to buy US brands. It is important to buy American Made products because not only is it better quality but we are keeping our workers in business! I really love the 5 ft. size tree but I think it will be nice to eventually have a trio of different sizes. That would be stunning too! I really want to win because I love decorating for the holidays and this tree would sure be the focus piece in my display!! I’d like to win this just because I think it would make a great looking Christmas tree! I think I would use this as the Christmas tree this year. It would be different, but I like lights, so it appeals to me. I do prefer to buy American-made goods when possible. You get the satisfaction of knowing they must meet certain quality standards, & you might be helping a business out, too. What a unique kind of tree to have! I love it! I try to buy American made so more jobs are created in the US. 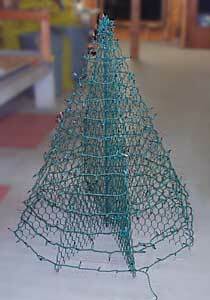 Crab pot trees are beautiful and made in the USA and perfect for my favorite holiday Christmas. I would like to win this because all of my friends would be jealous of how beautiful this Christmas decoration is. I think it’s very important to buy American made products to support our economy and workers. I’d love to won because we just moved to a new home and we desperately need to do some fun things to make it look beautiful and festive this year! I want to win to take my drab looking yard and make it special for the kids this Christmas. 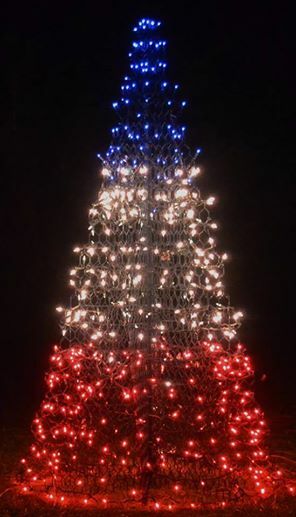 The Patriotic tree is awesome and I do not own one,…..yet. I’d put the first one on my porch. Important to keep OUR people working and help families around the USA. You get a bonus with a better product also. I’d like to win this because I think it would really brighten up our Christmas decor. I’m a big fan of sparkling lights, lol. This would be great as the actual Christmas tree! I think I would use it that way. I do like buying from American-made companies. I like possibly helping out new or local businesses, especially. I have one and love it!!! Great quality and amazing customer service! 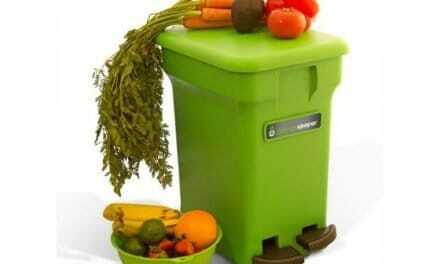 Let’s get all our people back to work and have quality products as well. I’d love to win because this gorgeous tree would really brighten up my yard! It’s beautiful! I want to win because this would be the perfect addition to my beautiful Christmas Display! I, unfortunately, do not own a Crab Pot Tree yet but really want to and I would love the 5 ft. tree! I try to buy American Made products as much as I can because there’s much better quality control in these products! I’d like to win this because these just look so neat! They would be a great addition to any Christmas decor. This article/giveaway is the first time I’ve seen crab pot trees, but I love the idea. They would look great as indoor or outdoor decoration. Buying from American companies is important to me. I think you get more assurance of a quality product. Every year I say I’m going to decorate for Christmas, but I never get around to it. This would be an easy way to get started and winning would motivate me to do even more! these are beautiful and I’d love to win one. My kids would be so excited to see this on our porch to decorate our home. I do not own one now but want to own several in the future. I would start with having one on our porch for all to see. The patriotic one is terrific. Keep our people in America working so everyone can benefit. Better made as well. it is such a unique look and I love having a lighted tree outdoors! I would like to win this because it’s beautiful and it’s would look great outside my house in the front yard. I’d like to win this because I love anything that lights up at Christmas, lol. This looks great. I really like the multi-color lights or the gold lights. Both are so pretty! I try to buy American-made whenever possible. I just like knowing there are high quality standards. I really want to win this because I have never had a Christmas tree of my own in my adult life! I would love to win this to display in front of my brand new house. It would be Perfect!! I do not own a Crab Pot Tree yet but I would display it out side..front and center for everyone to enjoy! It is important to keep our American workers in business and will get much better quality products as well! I think this would be beautiful in my yard! I love that it is made to be weather resistant, so I wouldn’t have to worry about rain or snow!